In Norway Many people have a tradition of making fudge for Christmas. 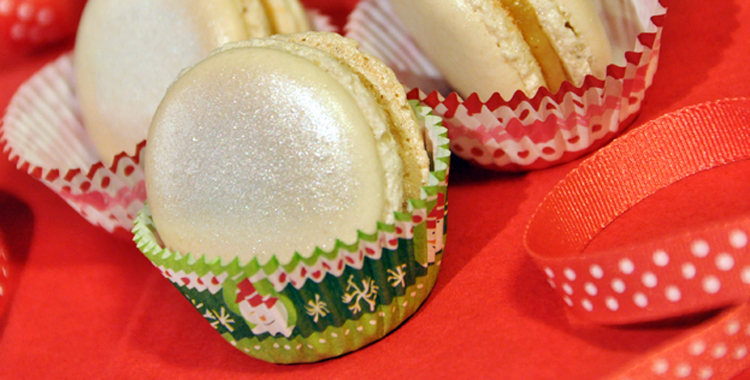 Maybe this year’s Christmas fudge can be turned into some wonderful macarons? To this caramel filling I have added small pieces of apple and some cinnamon, to really enhance the Christmas feeling. In our house this turned out to be a success :) If you put your macarons in the freezer, you have some great cookies to serve throughout the holidays. 30-60 minutes of thawing in the refrigerator and the macarons are ready to serve. Follow the base recipe for making the macarons. Chop the apple into tiny pieces. Put 1 teaspoon of butter in a frying pan and fry the apples along with the cinnamon, over medium heat. Put the apples aside. Heat the cream until it starts to boil, while you melt the sugar over medium to low heat in another saucepan. If the sugar starts to dry up and cluster, increase the heat and continue to stir gently. Wait until the sugar turns light brown (caramelize), and pour the hot cream gently into the sugar while stirring. Add the apple pieces and cook the mixture until it reaches 112 degrees (233 degrees Fahrenheit). If you do not have a thermometer, boil the mixture for approx 10min. Cool the caramel a bit, and whisk in the butter. When the caramel has thickened (after some time in the fridge), you can start sandwich the macarons. If you are able to, wait until the next day, or at least until the caramel is completely cooled. (If you don’t wait long enough, it will be too runny.) Use a teaspoon, a knife or a piping bag, whichever you prefer: turn a macaron upside down, add 1/2-1 teaspoon of caramel, and press the bottom of another macaron on top of it. < Win a macaron baking sheet!